Yes, I know I haven't been a very good blogger of late. It has been over a month since I last posted. Well, hopefully I will make amends here and now. It has been a productive and not-so-productive month in knitting. Productive - finished my first pair of socks. Here, fetching Heather models the fetching self striping Kroy yarn from Patons. I find socks a bit frustrating, as once you have turned the heel, all the excitement seems to go. I did manage to get past all that and make the mate to the first one. With two more pending sock projects to knit, I better find another way to get excited about knitting a whole sock or two. Not-so-productive - after knitting my sea silk shawl and getting about 1/4 the way through, I decided to frog it (rip it, rip it). I had dropped a stitch and in the effort to un-knit, I managed to drop more. It was also in question whether the finished item would be long enough, and I had wished I had blended the two skeins of sea silk when I had started. So, I frogged it and started over with fewer stitches (90 something vs. 100 something). The two skeins are blending splendidly so I have no regrets. 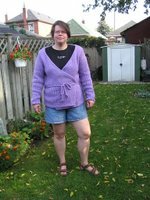 Productive and not-so-productive - here I am modeling the purple yarn ballet sweater that was started in May (around my birthday). Problem is, I tend to think it makes me look larger than my already ample physique. 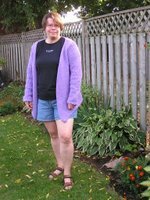 It could be the wide neckline, it could also be comparing myself to the skinny model that inspired me to knit the sweater in the first place (will I ever learn??). Anyway, all is not lost, I have decided to take artistic license and wear the sweater like this (with the ties at the back). Tell me I don't look as big! Now that this is done, I can start on the Bohemian sweater for Heather. I got the yarn from Lewiscraft before they went under (at 50% off), and hope with the cold weather coming that it will knit up quick. There are quite a few projects waiting in the wings, but I have my eyes on knitting up something in Patons new SWS yarn. We had a chance to fondle it at the last DKC meeting, and it is yummy. It is self striping and they have gone with some really beautiful colour ways. I do have to knock down a couple of more projects before I can take something like this on.....or at least that will be the plan. 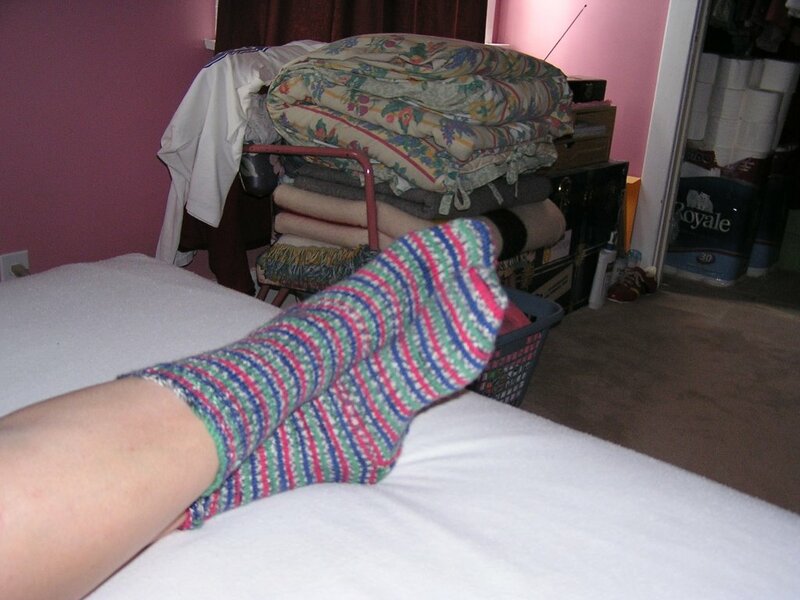 posted by shyknitter @ 8:09 p.m.
Great socks! I do like the sweater with the ties in back. Beautiful color, too!